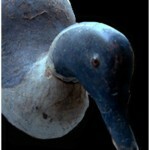 This was the least valuable duck, but the last of the Mohicans. It was early January, and, like so many couples, we had spent our last dime on closing costs for our home. My wife was off work, preparing to take the California Bar exam, I had a hectic schedule as a writer/photographer and fencing coach and we had a baby on the way. If anyone needed a little luck to tide us over the first month or two, we did. Buying a house in California is a tricky business. Alexandra took time from her studies to search for the few listings in our price range. We had looked at some pretty funky homes–gutted, tilted, bad neighborhoods and lead pipes. In our price range, we could get a decent condominium, with attendant homeowner fees, regulations and lack of privacy, or some variety of fixer upper or, with luck, a small finished home. We had bid on several homes, only one of which we really liked. Prodded by increasing prices and our powerful nesting instincts, we spread our search to Alameda, a little island hard by Oakland populated with Victorians, Craftsmen and graceful apartment houses used to once inhabited by officers and men stationed at the old Alameda Naval Air Station. One Sunday in early December, we looked at a little green stucco Craftsman house in Alameda. It was a charming home, though between a two-story duplex and a well-kept 20-unit apartment house, and on a rather wide street, near a busy intersection. For me, it was a jaw-rubber, for the wife, it was perfect. I saw the busy street, the nearby apartment building and the green paint, but she saw the great light inside, cozy bedrooms, open kitchen and the little oasis of a back yard with a south-eastern exposure. Plus, there was a rough stone fireplace and three small stained glass windows. It did have my only major requirement, a garage. It was a tiltly garage, four inches lower on one side, back higher than the front, and some of the beams inside had been cracked and fished, but it had stood for 85 years, and I reckoned it would stand a few more. The buildings on either side turned out to be a godsend, as their parking areas allowed us to get a full day of sun, even in January, and we had light reflecting into the side windows, lighting the whole house with indirect sunlight. The front and back yards were fifteen feet square, and the back yard was well sheltered by ancient shrubbery that gave near total privacy to the red cement patio and its corrugated green visor. It was a nice little home, with great light and new paint and freshly refinished hardwood floors. Long story short, we put in a bid, the owners accepted, and by January 3, we owned a home we could barely afford. We couldn’t move in, as Alexandra was in the throes of studying for the Bar, and we had agreed in advance if we found something to wait until after the test, but I could run over loads of non-essentials and poke around. Since we enjoy watching Antique Roadshow, I knew that attics were treasure troves, and couldn’t wait to check the nooks and crannies. On my first visit, leaving Alexandra hard at the books at the old place, I dragged an old splay-legged, spider-web-covered ladder out and propped it up in front of the garage, so as to reach the garage attic door. I forced the rusty latch open, heaved myself through the door, placed a careful knee on a dust-covered plank and looked around. There was a lot of stuff. Old wooden fishing pole sections, boxes of tangled fishing line, sinkers as big as golf balls, old fishing lures, a 25-foot-long crew oar with the letter P on it and … a box of ducks. Six decoys, faded gray, orange-yellow eyes, black beaks, with a hint of green, battered, buckshot, in a stinky old waxy fruit box. I was in a hurry–off to my afternoon job–so after turning the ducks over once, climbed down. Handsom devil. You'd take a load of buckshot to snuggle up to this fellow, wouldn't you? I don't really know if it is male or female. It was a week before I was able to get into the garage attic again, but I took the ducks with me. That evening, I laid them out on the floor of our living room. There were six ducks, all similar but none the same. Three of them were very similar, two others were obviously a pair and there was one with an odd body and loose head, but the head matched the first three. My wife and I surveyed these silent wooden beings, each unique, each oddly lifelike. I picked one up, went to my office and logged on. I laid out my first duck on a small worktable and began examining its details. After several hours on the Web, I knew enough to know I didn’t know enough. I needed professional help. I posted all the duck pictures on my business website, then posted one of the ducks in an online auction. 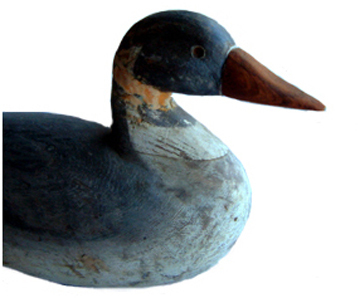 “This auction is for a pretty neat duck decoy. I found this in the garage attic of a home we just bought in CA. The home had been owned by the same family since it was built in 1925. I believe these belonged to the second generation, which had the home until we bought it a month ago. There is a bunch of fishing gear, so the former owner must have been a regular sportsman. “Description: I have looked around online and in one book, but have been unable to identify a maker. 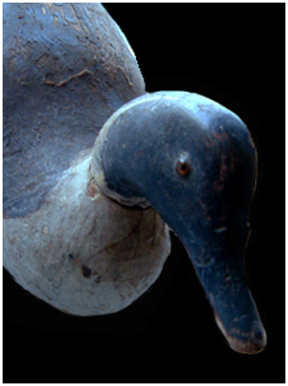 This duck is about 14.5 inches long, about 7.5 inches high at the head (measured as standing on the desk, so the mooring ring ads 1/3 of an inch), and about 5 inched wide. It appears to have a brown upper with green and white stripes along the sides in back. The bottom is white and looks to have been repainted. Tail is black stubby. Head has white stripes up the neck and a black carved beak. The eyes are of glass I think, and here’s why: they’re cold on my lip, and plastic doesn’t act like that. These babies were so Antique Roadshow-worthy. They did smell a bit, though. Of course, anyone would smell if they floated in Delta water then got shoved in an attic for weeks at a time. 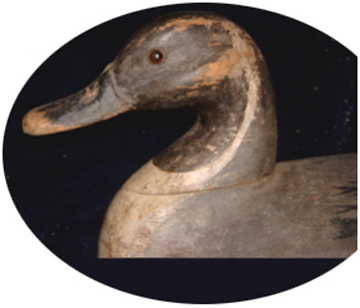 “Duck A: Looks like a Mason decoy factory Glass Eye model Body with a Mason Premier grade head. It looks like a pintail body with the sprig (tail) cut off of which should have extended out another four to five inches, coming to a point. You may do better to list the head and body separately as to what they are. I would guess that $160.00 would be fair to the right person. Duck B: is the same as A; Duck C: I thought this was a Premier grade head on a challenge grade body but the more I studied the pictures it is the same as A and B in my opinion. 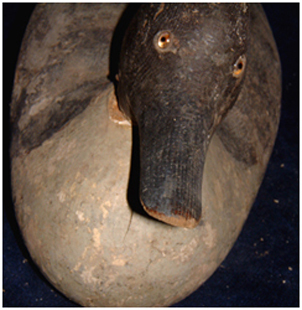 “Duck D: This one is interesting since it has the correct head for the body and looks like it has a lot of the original paint left on it however again the sprig was cut off. If I am reading the pictures right and the tail was not cut off this would of brought you $600 to $900 or better. May still bring you a couple of hundred. Some real data! I had a maker, some model names and value estimates. The good news was, the ducks seemed to be worth something, the bad news was, all the tails had been trimmed. Meanwhile, rent was due at our old house, Alexandra was enmeshed in her exam courses and I was trying to balance my jobs and move stuff over to the new house. Money wasn’t looking too good. We had really tapped out when closing costs had all been paid. I ran a fencing camp over Christmas to make some extra dough, but with moving costs things were going to be close, and we had that first mortgage payment looming, too. The ducks were suddenly worth enough to make a difference, if I could get full value. Consarn that busy bandsaw! If the previous owner hadn’t trimmed those tails, I’d be looking at a real hunk of cash, but I wasn’t giving up easy. The ducks seemed to be rare and as a British sports car and fencing fanatic I know that people will pay a lot of money for something they really want. I thanked everyone for their help and told them that to be fair, I would sell them one by one in online auctions. The first auction was coming to an end and I watched the finish closely. Online auctions sit for days with little or no activity, then flame up in the last few minutes. This auction was no different. It rose slowly over the week, and peaked at $169. I hoped that since I could now add real data to my listings, I could beat that. A little publicity goes a long way. One week later, I called my wife in to watch the auction end. The duck had a modest bid of $59 until the last day, when it climbed slowly to $113, where it sat for the final two hours. As we watched, the auction closed. I figured maybe that was it, but decoy enthusiasts had been busy in those last few seconds. Three bidders had rapidly pumped up the price. Upon refreshing the screen once more, we both gaped in astonishment: Duck B, $342! The last of the three Mason Pintail Premiers went for $302 to the same guy that bought the first one. Then came time for the Fresh Air Dicks. I had been told by two people they were worth between $450 and $600, so I sold the pair in a private auction to one of my helpful correspondents for $1000. It only went for $130, but we had our first mortgage payment. Those lucky ducks were good to us and they all went to good homes.